Land is one of the world's most emotionally resonant resources, and control over it is fundamental to almost all human activity. From the local level to the global, we are often in conflict over the ground beneath our feet. But because human relationships to land are so complex, it can be difficult to think them through in a unified way. This path-breaking book aims to change that by combining insights from multiple disciplines to develop a framework for understanding the geopolitics of land today. 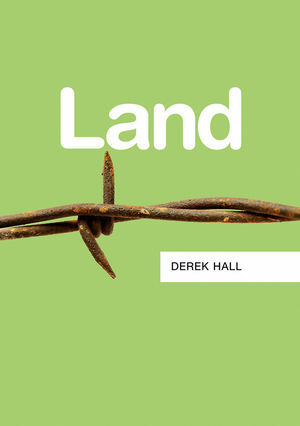 Struggles over land, argues Derek Hall, relate to three basic principles: its role as territory, its status as property, and the ways in which its use is regulated. This timely introduction explores key dimensions of these themes, including inter-state wars over territory, the efforts of non-governmental organizations to protect property rights and environments in the global South, and the ‘land grabs’ attempted by contemporary corporations and governments. Drawing on a wide range of cases and examples - from the Afghanistan-Pakistan border to the Canadian Arctic, China’s urban fringe to rural Honduras - the book provides new ways of thinking about the political dynamics of land in the 21st century. This richly detailed and authoritative guide will be of interest to students across the social sciences, as well as anyone interested in current affairs and contemporary geopolitics. Derek Hall is Associate Professor at Wilfrid Laurier University. "Hall's personable, engaged approach provides an ideal entry point into this difficult subject." "A very good introduction to and overview of the "transnational politics of land" in the early twenty-first century." "Theoretically astute, lucidly written and argued with rigour and impeccable logic, this wide-ranging magisterial synthesis is indispensable reading for anybody concerned with war and peace, colonialism and post-colonialism, indigenous rights, contemporary land-grabbing, debates over sovereignty, agricultural development, social justice movements, environmental conservation or the human future." "Chinese planning eco-tourist resorts in Iceland, Saudi Arabians planting rice in sub-Saharan Africa and South Koreans raising cattle in Australia? In Land, Derek Hall explains how and why these unfamiliar associations may soon become the new norm. The explanation rests on the contention that land and its control are as fundamental as ever to national and international geopolitics, transnational trade and human survival." "The author builds on recent literature from diverse areas to help the reader understand the complexities of land-related issues. The concepts of territory, property, and regulation frame the study and help the reader understand how transnational politics shapes contemporary land issues and struggles. The book is essential reading for an overview of the crucial dynamics pertaining to land use and conflict, from the local to the global." "An excellent overview of a very complicated set of issues. Derek Hall does a skillful job of bringing multiple literatures, examples and ideas together in an insightful and eminently readable book. Particularly impressive is Hall's ability to maintain a conceptual framework while providing good analysis and rich empirical detail."